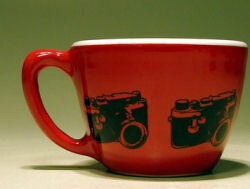 Retro camera decorated products seem to be big at the moment and whilst aprons and necklaces aren’t going to appeal to everyone, these Retro Camera Cups should be more people’s cup of tea (if you’ll excuse the pun). Made by Circa Ceramics, whose decorative tiles we featured a few months ago, each cup holds 12 oz, has an old-fashioned handle and is finished with a glossy glaze. They are available with either Leica or Starmite camera pictures for you to choose from and the colours available vary. To view cups currently available or place an order, visit Circa Ceramics on Etsy.